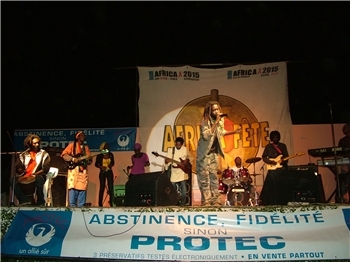 grands espoirs de la nouvelle génération du reggae africain. et dont les albums devraient être prochainement disponibles. bientôt faire parler de lui dans l’hexagone. After attending Saint Gabriel college, Maxim became disillusioned with school and decided to pursue his musical dreams. He initially joined the group Family MC where he began as a rapper. Soon after, he turned to reggae and created his own group, Big Nation Possee. During this time, he also played with the Ics Orchestra. When Maxim decided to pursue his solo career, he changed his stage name to Dread Maxim. The name Dread both refers to his signature dreadlocks as well as the double-entendre meaning dreadful/terrible. This self-naming expresses the singers desire to be dreadful in order to scare away the forces of evil. Dubbed by the press as the Rasta Prince and the Alpha Blondy of Senegal, Dread Maxim has the sinuous voice of Rastafaris, and is very much inspired by Jamaican music, especially Bob Marley. Dread Maxim is already a household name in Senegal, and plans to make his mark internationally. Rejoyce, a production company based in Versailles, recently released his single, Hope, in a compilation that includes pop, rock, reggae, Gospel and electro music. Dread Maxim plans to tour internationally in 2008 and spread his music and his message to more audiences around the world. Un jour viendra, le Sérère disparaîtra. Un jour viendra, notre langue disparaîtra. Si on n’'y chante pas, Un jour le sérère s'’en ira. Comme elle est belle notre langue. Tu marches et tu t’'en vas. Arrête de faire le fainéant. Et le bon Dieu nous aidera. Auprès de mon grand pére Amath Thiolké. Cultiver notre part du champ. Mangeons dans le même plat. Et de la même mère.